The emerging raw food movement is establishing itself as a potentially healthier alternative to the Western diet that increasingly consists of processed and cooked foods. Citing the sole reliance on raw foods of our distant evolutionary ancestors, the raw food diet comes with claims of a host of health benefits attributed to this more "natural" way of eating. While this might be true of some raw foods (like fruits and vegetables), there are potentially negative side effects of eating uncooked grains. According to Todar's Online Textbook of Bacteriology, Bacillus cereus is one type of bacterium that can cause food poisoning. The Bacillus cereus bacterium is found in a variety of foods — including raw rice — with different strains associated with a host of potential health benefits and negative side effects. Some strains of this bacterium compete with other bacteria in the digestive system, serving as a probiotic and reducing the amount of potentially harmful bacteria such as salmonella. Other strains, however, are potentially harmful to humans. Of these harmful strains, the emetic, or vomit- and nausea-inducing, strain is primarily associated with rice products. According to Food Standards Australia and New Zealand, when rice is uncooked or undercooked, this strain of Bacillus cereus produces a toxin called cereulide, which can lead to vomiting and nausea within 24 hours. The diarrheal form of Bacillus cereus induced food poisoning has an incubation period of eight to 16 hours. After this timeframe, abdominal cramps and diarrhea occur. Lectin is a protein that serves as a natural insecticide with a strong affinity for carbohydrates. Found on uncooked rice and beans, this protein is one of the leading causes of food poisoning, according to Medical News Today, and can lead to nausea, diarrhea and vomiting when eaten in abundance. This occurs due to lectin's prevention of the repair of gastrointestinal cells that are damaged when eating. This natural process of damage and repair is associated with gastrointestinal health and regularity, and when inhibited, can lead to the symptoms of food poisoning. 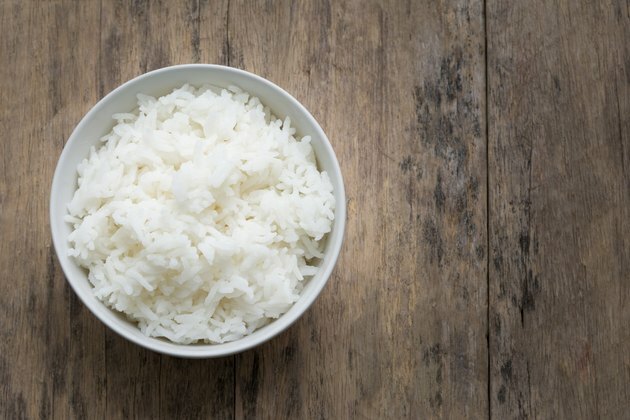 Over the long term, the lectins found on uncooked rice are associated with the development of celiac disease, diabetes and colorectal cancer. According to Medical News Today, cooking does not destroy all the lectin present in uncooked rice. As a result, gas and bloating can also occur from eating cooked rice. The outer cellulose coating on rice, similar to that found on the leaves of most green plants, helps to protect the grains from damage. This protective property also is associated with poor digestion, with the human digestive system unable to process most cellulose-rich foods, according to NutrientsReview. While cellulose-rich foods serve as dietary fiber and promote digestive health, the inability to digest the cellulose coating of rice diminishes its nutritional content. When cooked at temperatures at or above that of boiling water, however, this cellulose coating is damaged. This leads to an increased digestion of rice, as well as increased absorption of its proteins and other nutrients. Beyond Vegetarianism: Does Cooked Food Contain Less Nutrition?